"Training" redirects here. For the Training Mode exclusive stage in SSBU, see Training (stage). 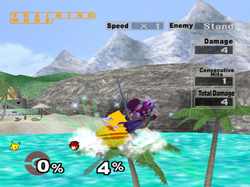 The Training Mode in Super Smash Bros.
Training Mode in Super Smash Bros. Melee. Training Mode in Super Smash Bros. Brawl. Training Mode in Super Smash Bros. for Nintendo 3DS. Training Mode in Super Smash Bros. for Wii U. Training Mode in Super Smash Bros. Ultimate. Training Mode (トレーニング, Training), or simply Training in Brawl, is a mode available in all games of the Super Smash Bros. series where the player can manipulate overall gameplay of a match and experiment with the CPU without the restrictions of standard Versus Mode. The mode's features, behaviors, and properties vary throughout the series. As implied by its name, Training Mode is intended to allow players to practice using characters in a non-serious setting. All matches within the mode are actually Time matches of infinite length, as seen on the Jumbotrons featured in the Pokémon Stadium stages. The player can use any character they wish and select one CPU character as their opponent. Any stages available to the player can be used in the mode, including Smash 4's Ω form stages and Ultimate's Battlefield form stages. In Ultimate, Training Mode features an exclusive stage (although other stages can still be selected) with a grid that displays exact distances between points. A new modifier allows drawing of launch distances and trajectories for an attack: a red, green and blue line will display the predicted distance and trajectory for that attack as if it was used against an opponent at 0%, 50% and 100% damage, respectively. The weight of the targeted fighter is factored into the predictions as well, allowing for detailed calculation of how well an attack will perform in any given circumstance. Interestingly, Stale-Move Negation is not present in the mode for Brawl or SSB4, though a new modifier in Ultimate allows the player to turn it on or off. Additionally, in SSB4, the rage mechanic is ignored and pausing while in Training Mode will freeze the stage and all such elements, but not the characters or items. Within Training mode, a specialized UI overlay, unavailable in any other mode, is displayed on the screen in order to show data relevant to gameplay. The overlay is always present in Smash 64, Melee, and Smash 4, but is disabled by default in Brawl. Speed: Shows the speed at which the game is running. Not present in Smash 3DS, and hidden in Ultimate if the default 1x is selected. Enemy: Shows the behavior set by the player for any CPUs in play. Not present in Smash 4 or Ultimate. Damage: Displays amount of damage most recent attack inflicted by the player. Up until Ultimate, decimals could not be visibly seen, leading the damage display to round off to the nearest whole number. Weaker attacks dealing 1%< damage may be displayed as dealing "0%" damage. Combo/Consecutive Hits: Displays how many hits the player has attained on the opponent in one standard combo; this data is saved, with the longest combo done by each individual character being displayed on the character select screen for the mode. The counter in the overlay will top out at 999, though the mode can display higher combos on the character select screen. Named "consecutive hits" in Melee and Brawl and named "combo" in the other games. In Ultimate, use of items will cause the combo counter to turn red and not save as a longest combo (or unlock anything that requires a certain combo). Total Damage: Added in Melee, this displays how much damage the present combo has done on opponents. Like the Combo counter, it maxes out at 999. In addition to allowing players to train against an ordinarily idle opponent or to perfect their timing in combos or other advanced techniques, the player has the option of manipulating the environment of the stage or gameplay. Initially limited in Smash 64, modifiers within later games were more advanced. Modifying the match's parameters requires using a specialized menu accessed by pressing the pause button; while this menu stops the CPU from performing actions, it does not actually pause the battle, and so items on the stage and other stage hazards can potentially harm the player while they apply modifiers. As the Nintendo 3DS has two screens, the bottom touch screen can be used to manipulate the environment without having to pause the game. Speed: Allows the player to alter the gameplay speed of the match, though some aspects of gameplay, such as transformation Final Smashes and stage hazards, are unaffected by this setting. Melee added factors of 1.5x and 2x, though 2x speed was removed from Brawl onward. Smash 3DS also removed 1.5x speed, but added a second version of 1/2x and 1/4x where time only advances while the L button is held down (regardless of the player's control settings). Smash Wii U re-added the 1.5x speed. Ultimate removed the 1/2x and 1/4x "hold" options and replaced them with a new "1 frame" option, which allows the player to advance by exactly one frame by tapping the ZL button. The game will run at full speed while the button is held. Spawning an item while in 1 frame mode will also automatically advance the game forward 1 frame. Item: Allows player to spawn an item of their choice on the stage. As the pause menu does not stop gameplay, items can interact with the environment while the stage is paused. Brawl introduced the ability to spawn Capsules, Crates, and Barrels. Ultimate added the option to spawn specific assist trophies or Poké Balls, but some can't be selected on certain stages. CP/CPU: Modifies the behavior of the computer-controlled players, such as to make them stand still, constantly jump, or evade the player's attacks. For a list of all available behaviors in various games, see List of CPU modes. No. of CPUs: Allows the player to decide on how many CPUs to include in the match. 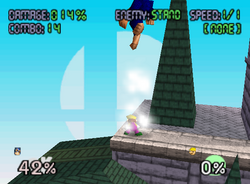 Introduced in Melee, the player can spawn one, two, or three opponents, though they will all be of the same character as the one selected prior to the match. CPUs cannot be harmed by each other's attacks, such as when "Attack" or "Control" is selected for their behavior. In Ultimate, the 1v1 multiplier will be inactive if the no. of CPUs is more than 1. CPU Damage: Changes the damage all computer-controlled opponents have. Can be anywhere from 0 to 999, and is set upon closing the pause menu (so pausing the game to modify other values will reset damage to the value set). In Smash 4, it changes the damage all players have. Camera: Allows the player to modify how the Camera looks at the stage. Smash 64 allows for "Normal" and "Close-up", the latter of which zooms in on the player. Melee adds a "Free" option that by default zooms in the camera to a lesser extent than the renamed "Zoom" option, but allows control of the camera with a second controller. Brawl removed the "Free" option. Smash 4 kept the Zoom and Normal modes, while also adding Fixed-Camera, zooming the camera out so that all of the stage is visible. Ultimate renamed the "Zoom" option to "Max Zoom" and added a new "Zoom" option that is less zoomed in, similar to the default "Free" option in Melee. Reset: Completely resets the stage and sends all characters back to their original spawn points. All items are removed from play, and the stage returns to its original form; damage percentages are reset to 0. The music track that was playing will also restart. Nonexistent in Brawl. Exit: Sends the player back to the character selection screen. Move List: Allows the player to read about characters' special moves (including Final Smashes), as well as character-specific information like Aura. Fixed Damage: If enabled, CPU percentage will not increase upon taking damage. Trajectory Guide: Shows the launch trajectory of the most recent attack at 0% (red), 50% (green), and 100% (blue). Invincibility: When enabled, portions of characters will glow blue when intangible and green when invincible. CPU Shuffling: Sets the amount that CPU opponents will attempt to DI or SDI. Stale Moves: Manually enable or disable stale-move negation and rage. P1 Damage %: Sets the damage percentage of Player 1. The pause screen in Super Smash Bros.
Getting an 11 hit or higher combo will grant the player the Metal Box trophy. Getting a 21 hit or higher combo will grant the player the Lip's Stick trophy. Getting a total of 125 combined combos will grant the player the Bunny Hood trophy. Getting a total of 400 combined combos will grant the player the Ouendan trophy. Getting a 10 hit or higher combo will grant the player the Huge Header custom special move. Getting a 40 hit or higher combo will grant the player the Beam Sword Agility Badge equipment. Getting a 100 hit or higher combo will grant the player the Protective Gear outfit. Getting a total of 400 combined combos will grant the player the Leaper Ability Badge. Getting a 30 hit or higher combo will grant the player the Title Theme (Wii Sports Resort) music track. Getting a 50 hit or higher combo will grant the player the Unharmed Speed Demon Agility Badge equipment. Getting a 20 hit or higher combo will grant the player the Lion spirit. Example of the effects of the Character Loading Input Delay, with all four players using the same input on the same frames. Up tilt was pressed repeatedly until the desync was noticeable. In Brawl, after adding additional CPUs to a match, those CPUs do not function correctly when set to Control. It is unclear exactly what causes it, but they do not act on the same frame as another character using the same input, causing both input delays and ignored inputs. Opening and closing the training menu (by pressing the pause button) fixes this until a new CPU is added. This does not occur in Melee. There appears to be an issue with the combo count in Smash 4 which is demonstrated in a video by the Beefy Smash Doods, where true combos will not be displayed as combos and vice versa. This is believed to be due to the formula for hitstun being different in training mode than in a regular smash, although it may also involve not being correctly adjusted for hitstun cancelling or gravity compensation. 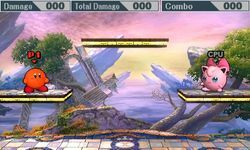 In Super Smash Bros., the background of each stage is changed to the Smash Bros. emblem and the music for each stage is changed to the Training Mode theme. In Super Smash Bros. Melee, the most recent Pokémon to be unleashed from a Poké Ball in Training Mode will either be the second Pokémon that appears in a standard Versus match, or the first in a Single Player mode. In Brawl, if Player 1 uses a trapping Final Smash on any spawned players and then despawns them, the player will resume the Final Smash on nothing. In Brawl, while on standby, CPUs may occasionally react to non-flinching attacks. In Smash 4, Smash Balls in Training mode are now easier to destroy than in Brawl. 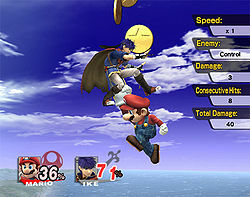 In Smash 4, the CPU number and behaviour cannot be changed if any player possesses a Smash Ball, the former of which prevents the situation described above from happening (Final Smashes attacking nothing). Damage also can't be modified during a Final Smash attack. Items also oddly cannot be spawned while any character is in hitstun or in the tumbling animation. In Smash 4, although opening the Training Mode menu otherwise disables all actions for fighters so that the player can toggle the menu options, the game oddly still enables the shifting of the position of shields while the menu is open (which can be accomplished by activating the shield and immediately opening the menu before the shield is dropped). It is not known what causes this glitch. In Smash 4, if a character in Training Mode has All-Round Trade-Off Equipment they will start with 0% damage (with the damage meter even doing the "damaged" animation) instead of 60%. This can be fixed by pushing Reset in the training menu. If Palkia is summoned in Training Mode in Super Smash Bros. for Nintendo 3DS, the "Info" displaying the damage, total damage, and combo numbers will be present while the stage is being flipped, meaning that, rather than hiding the information, the game simply moves it off-screen. As such, the numbers are upside down if the stage is flipped. In Super Smash Bros. for Nintendo 3DS, if the speed is set to a (Hold L) setting, the character models will change when the button is held. This is because the game indirectly pauses when the L button is not held, and Smash 3DS switches the detail of the character models between gameplay and pausing. When CPUs are set to Control in Super Smash Bros. for Wii U, they will remain with a grey box and CPU tag, but will use human player colors for their shield, launch indicators, Blast KO color and Villager's Balloon Trip (for example, the first CPU will use Player 2's blue color). This was also the case for the shield and blast line color in Brawl. The only things that override the stage freezing that occurs when bringing up the menu in Super Smash Bros. for Wii U are the clock present in Smashville and Town and City and the character titles "rolling up" animation in Boxing Ring. Despite time being slowed down, in Super Smash Bros. for Wii U, the "numbers breaking" animation for the Damage meter plays faster if the speed is set on 2/3x. If one resets the training session in Super Smash Bros. for Wii U during the "numbers breaking" animation, the Damage meter will become stuck in the shaking animation until the affected player takes damage. In Ultimate, a glitch causes the individual Damage counter to display 0.1% less damage for certain moves with decimal damage values, despite the Total Damage counter showing the correct amount of damage applied to the opponent. An example is Mario's pummel, which deals 1.3% (without the 1v1 multiplier), but erroneously displays 1.2% in the Damage counter. In Ultimate, when the game is paused, attacks and damaging stage hazards go through fighters without damaging them. As a result, pausing is disabled during a Final Smash, most likely so that the game wouldn't crash from having their Final Smashes pass through opponents. This page was last edited on April 12, 2019, at 02:23.